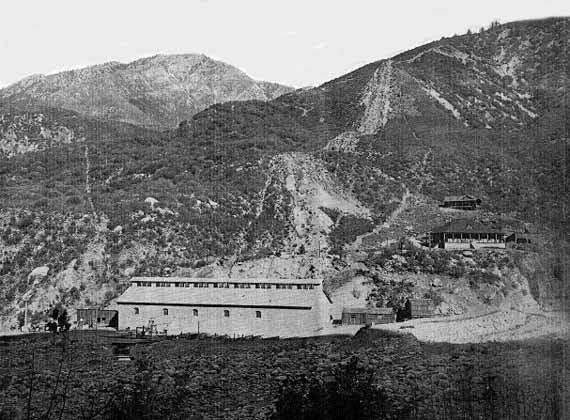 The Santa Ana project of the Edison Electric Company of Los Angeles, CA was the power transmission marvel of the world. A 33kV, 83 mile line to Los Angeles was constructed from the plant north of Redlands. In 1903, Journal of Electricity, Power and Gas described it as “This far-famed 33,000-volt eighty-two-mile line, which for years was unequaled, both in length and voltage, by any line in the world.” A new insulator, “the Redlands Type,” was designed for the line and supplied by Imperial Porcelain. This insulator is now known as the U-746. An in-depth discussion of this and related designs by Robin Harrison appeared in Power Line Explorer Journal, Vol. IV, No. 1. It is somewhat ironic that the “Redlands” insulator was used on the Santa Ana line, and the “Santa Ana” insulator was used on the Redlands line.